QUEZON CITY, Philippines (Eagle News) — Eagle Broadcasting Corporation on Saturday, February 24 conducted a citronella planting and clean-up drive in Pasong Elementary School in Quezon City, as part of the activities of EBC to mark its 50th anniversary this year. 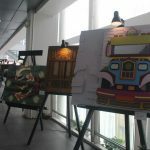 The event was participated in by the employees of the Eagle Broadcasting Corporation together with the teachers, students and department heads of the Pasong Tamo Elementary School. EBC’s clean-up drive and citronella planting hopes to help the community to combat the dengue problem in the school. The benefits of the citronella were also explained to the teachers and students, including its impact in the environment and disease prevention. Citronella grass is the most commonly used natural ingredient in mosquito repellents. It is also known for its distinct smell that can help keep mosquitoes at bay. Aside from the tree planting and clean up drive, talents and DJs of Pinas FM 95.5 brought live entertainment to the event. Teachers and students thanked the management of the Eagle Broadcasting Corporation and its employees for their generous contribution to the school with the tree planting activity to combat the dengue problem in the area.